2 The Boxer Uprising (拳亂), Yihetuan Movement (義和團運動), “The Righteous and Harmonious Fists”. 1899 – 1901. 2.1 To fully understand the rancorous feelings of boxers towards foreigners, one must necessarily look at the tormented historical context. The Boxer Uprising (拳亂), Yihetuan Movement (義和團運動), “The Righteous and Harmonious Fists”. 1899 – 1901. 1 The Boxer Uprising (拳亂), Yihetuan Movement (義和團運動), “The Righteous and Harmonious Fists”. 1899 – 1901. 1.1 To fully understand the rancorous feelings of boxers towards foreigners, one must necessarily look at the tormented historical context. To fully understand the rancorous feelings of boxers towards foreigners, one must necessarily look at the tormented historical context. 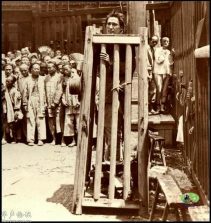 During the nineteenth century Chinese pride and the estate of the Manchurian dynasty were severely put to the test: for sixty years, China was forced to import the opium that had caused a long series of social problems, had been defeated and bent in numerous wars, forced to promote Christianity in its territory and forced to sign a long series of unequal treaties that granted foreign powers and their commercial counterparts a series of privileges, extraterritorial rights, and immunity. England, Japan, Russia, and Germany dug their spheres of influence and at the beginning of the twentieth century, China seemed only a land of easy conquests. The Yiheyuan movement,The Righteous and Harmonious Fists, was a secret society founded in today’s Shandong province and consisted mainly of people who had lost everything due to natural causes or imperialism. The group developed from a branch of the Li sect of the religious group Bagua (Eight Trigrams). Westerners began to call “boxer” the followers because of their martial arts skills. One of their main characteristics, according to Larry Clinton, was spirit possession, which included swirling swords, violent prostrations, and performing spells to subjugate Taoist and Buddhist spirits. The Boxers believed that through training, diet, martial arts and prayer they could develop some special skills, like flying. These concepts were then borrowed in the modern qigong movements born after the death of Mao and which proliferated throughout the eighties and nineties. Moreover, according to some popular traditions, the soldier spirits would descend from heaven to assist the people in their battle against foreign influences. Most of the adherents came from the weakened peasant class and other weak social classes, desperate by the continuous natural calamities and the rampant spread of opium. Christian missionaries, Chinese Christians, and European colonizers were blamed. The missionaries were protected by extra-territorial policies. The Boxers called foreigners and Chinese Christians with the pejorative appellation of Guizi (or demons). Even today, foreigners are called in derogatory terms in this way or variations of this term. The boxers were equipped with light armaments, such as swords and rifles, but they claimed to be invulnerable to the guns, to the fire of the guns and to the wounds of the white weapons. The boxers were preceded and anticipated by other societies that provided the cultural and organizational basis for the movement. The Big Sword Society (Dadaohui, 大刀會) was a peasant self-defense group that had spread to northern China and gained notoriety thanks to the courage of its members. It was predominantly formed by local groups of small landowners and tenants who were organized to defend villages from raids by bandits, warlords and sometimes tax collectors. The Great Masters of these societies claimed to be invulnerable to the bullets thanks to magic and a series of breathing exercises. Once merged into the great revolt of the boxers, this movement survived the decline and later fought against the Japanese and the Communists from time to time. The members of the brotherhood placed their faith in folk magic and believed in the right rewards in the afterlife. Some of these companies were later absorbed by the Red Army during the Second Japanese Sino War or the People’s Liberation Army during the Chinese Civil War. In 1953, the Communist Party launched a campaign to suppress the Hui Dao Men. 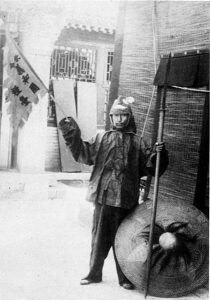 In any case, in 1895, Yuxian, the Caozhou prefect who later became provincial governor, requested the support of the Society of the Great Sword to fight local bandits. Despite the heterodox practices of the adherents, they were not perceived as a threat by the ruling dynasty. Their efficiency in defeating the phenomenon of banditry had led to a large number of executions of bandits by members of the group. The Big Sword continued in its cleaning work, but many bandits began to convert to Catholicism obtaining legal immunity and entered under the protection of foreigners. The Big Sword responded by burning the Catholic churches that offered hospitality to the bandits. 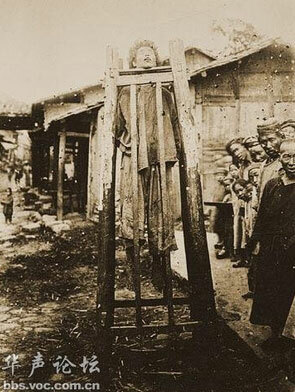 Yuxian was forced to execute numerous group leaders. In the meantime, following the example of the Big Sword, more and more secret societies began to flourish in numerous villages. In this first phase, however, the attention of the various groups such as the Red Boxing school, the Ploom Flower Boxers or other Shandong boxers, was focused on traditional social and moral values, such as filial piety, rather than on strangeness influences. A leader, for example, Zhu Hongdeng (Red Lantern Zhu), began his career as a healer, specializing in skin ulcers and gaining respect by refusing compensation for his treatments. Zhu, claimed to be a descendant of the Ming dynasty since his surname was that of the imperial family. He claimed that the purpose was, paradoxically, to revitalize the Qing (also a foreign dynasty) to destroy foreigners. International and domestic tensions fueled the movement which soon spread with unprecedented fury. During the two-year period of 1897-98, the province of Shandong was severely hit by a series of overflows that forced masses of farmers to leave the fields to head for the cities in search of food. Christian missionaries were another cause of discontent. In this period,they began to be increasingly active. Above all, their immunity aroused the ire of the local inhabitants. On November 1, 1897, a gang of about twenty armed men broke into the residence of a German missionary, George Stenz. Two priests, Richard Henle and Francis Xavier Nies, were killed, one of whom was a guest of the missionary who was sleeping in the area reserved for servants. The Christian inhabitants of the village rushed to defend it and drove the assailants away. When Kaiser Wilhelm II was informed of the news, he ordered the East Asian German Squadron to occupy Jiaozhou Bay in the south of Shandong, triggering a concessions race during which Japan, Russia, France, and England secured spheres of strategic influence in China. 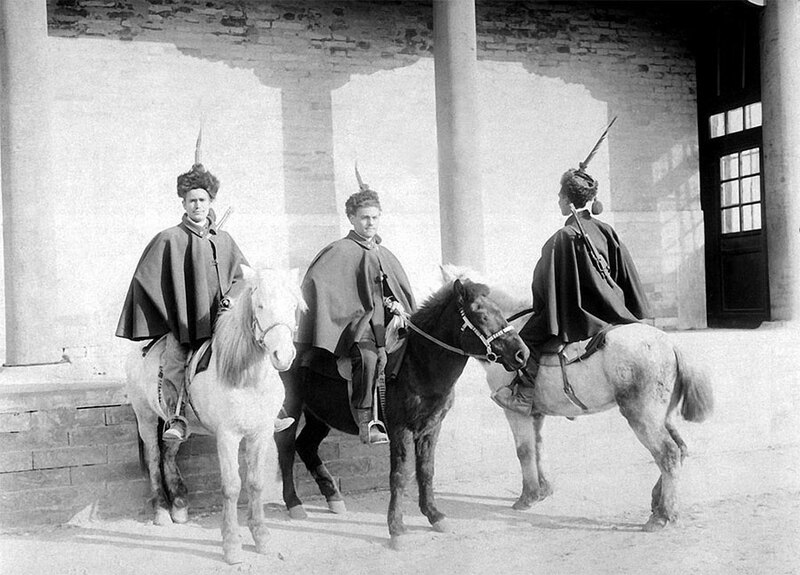 Because of the German demands, the Manchurians were also forced to remove numerous officials in Shandong from their positions and to build three Catholic churches at their own expense, to compensate with the 3,000 taels of silver the attacked mission and to build, at Chinese expenses, seven fortified residences; the German settlement strengthened the work of the missionaries and these unfortunate choices only exacerbated the anti-foreign sentiment that would soon lead to the bloody Boxer Revolt. In October of the following year, the Boxers attacked the Christian community in Liyuantun village, where a temple dedicated to the Jade Emperor had been converted into a church. Criticisms had been raised since 1869 when the temple was given to Christians residing in the village. The incident also coincided for the first time with the slogan of Zhu Hongdeng “Support the Qing government and exterminate the foreigners“. The aggression against the missions and the Christians ended up attracting, even more, the attention of the European governments. In 1899, the French minister in Beijing helped the missionaries obtain an edict guaranteeing an official status to each member of the Roman Catholic Church hierarchy, thus allowing local priests to support their faithful in family or legal disputes, bypassing the authority of local officials. After the German took over the Shandong province, many Chinese people began to fear that Christians and their foreign governments were trying to divide and colonize China, piece by piece. Also according to Larry Clinton Thompson, a Chinese official expressed his disappointment: “Take away your missionaries and your opium and you will be welcome”. The growth of the movement coincided with the Reform of the Hundred Days promulgated by Emperor Guangxu, under the influence of reforming officials, supported by Protestant missionaries. But the reform did nothing but alienate numerous conservative officers who urged Empress Dowager Cixi to intervene and repeal the reform. The failure of the reformist movement disillusioned the Chinese intellectuals, leading to a further weakening of the dynasty. Once the reform ended, the empress had Guangxu arrested and assumed power. The Europeans sympathized with the deposed emperor and opposed Cixi’s plans. Thus, the dawn of the new century saw a substantial change in Chinese politics. 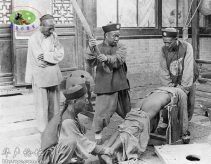 In January 1900, conservatives at the court of Empress Dowager changed their policies towards boxers and issued a series of edicts to defend them, obviously causing protests by foreign dignitaries. During the spring of the same year, the movement had rapidly spread from Shandong to Beijing. The boxers burned Christian churches, killed the faithful and intimidated the officials they met on their way to the capital. On May 30, at the request of some diplomats led by the British minister Claude Maxwell MacDonald, the Chinese court saw itself requesting the deployment of foreign soldiers in defense of foreign delegations. Reluctantly, the government granted permission. The next day, 400 soldiers from eight countries disembarked from the warships in Tianjin and headed to the capital, preparing the defensive perimeter for their respective missions. On June 5, the railway linking Tianjin to Beijing was cut by boxers, now on the outskirts of the capital and Beijing was isolated. On June 13, a Japanese diplomat was assassinated by General Dong Fuxiang‘s soldiers and the same day the first boxer was sighted in the delegation’s neighborhood. In the afternoon, German minister Clemens von Ketteler and his soldiers captured a young boxer and executed him for no reason. In response, thousands of boxers invaded the city and burned numerous Christian churches and cathedrals. 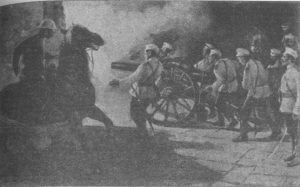 The British and German soldiers fired on the rioters, killing many, antagonizing the local population and the Manchurian dynasty. 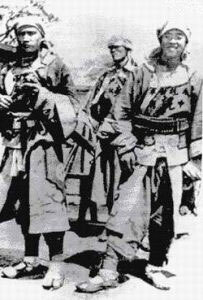 Muslim Hui soldiers from Gansu, known as “Gansu Brave”, commanded by Dong Fuxiang. 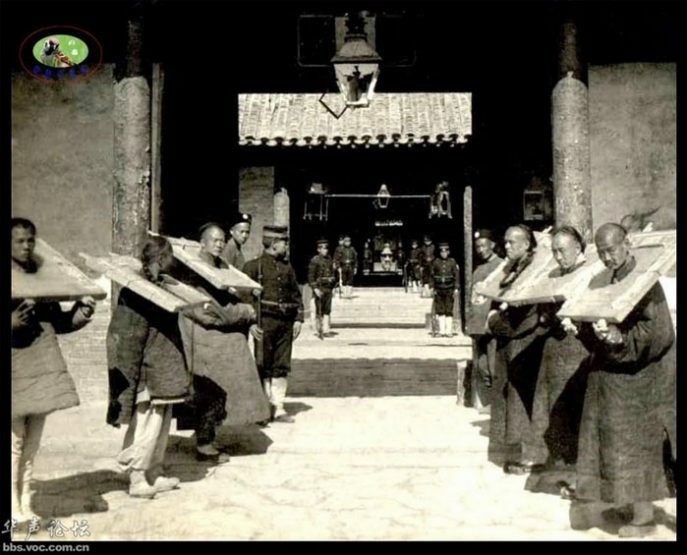 Muslims from Gansu province (Muslim Gansu Brave, aka Kansu Braves), boxers and other Chinese attacked and killed numerous Christians for revenge. Between 16 and 17 June at the imperial court discussions were held on the profile to be maintained against the boxers. Both factions agreed that the boxers could count on an almost universal consensus in the countryside, and a suppression of the movement would have been unpopular, in a moment of extreme weakness, a risk likely not to be run. Traditional conservatives wanted to use boxers to remove foreigners once and for all from Chinese soil, while the moderates recognized a weak position for China and preferred to use diplomacy. In the meantime, this dualism was also reflected in the non-homogeneous behaviors held by the Chinese army. There were those who defended the foreigners by order of the empress, but also those who fired on isolated foreigners, who tried to keep the boxers away from the delegations and who instead ransacked the possessions of foreigners in the palace, as Prince Duan did. Meanwhile, the boxers were organizing: the most experienced were sent to the incoming western reinforcements, while the young were absorbed in the Gansu army. Since the Manchurian dynasty had not clearly decided with which team to play, the confusion reigned supreme. Foreign delegations continued to be besieged now by imperial forces and Kansu. 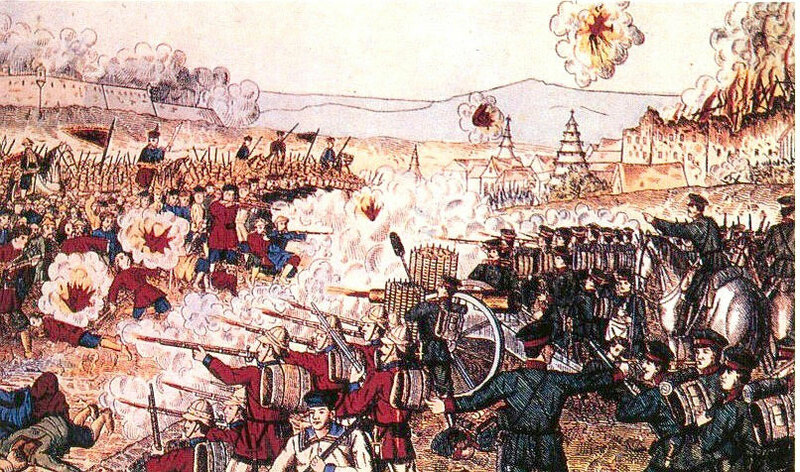 But while the Kansu reinvigorated by the new boxer recruits were pressing to destroy the delegations, the Imperial led by Ronglu, by order of Dowager, protected the foreigners, although, from time to time, Ronglu, to win the friendships of the conservatives in the palace, did shoot against the delegations fireworks. Meanwhile, the besieged, panicked, fired at everything that moved, including left-handed emissaries, civilians, and assailants. Having received an explicit ultimatum from the foreign powers in order to hand over the control of the country in their hands, the angry empress Cixi stated that if China had to be annihilated, it was worth fighting to the end. From this moment, China tightened the delegations with its armies and began the siege. On 17 June, foreign fleets not far from the Dagu fortress near Tianjin were attacked. The Chinese forces placed naval mines at the mouth of the Peiho River before the battle, in order to prevent Alliance intervention. On June 16, the commanders of the various warships met. The success and the salvation of the lines of the soldiers remained cut in Chinese territory (the 400-450 soldiers in Beijing, the 2000 men of the Seymour force, the 2400 Russians in Tianjin) depended on the control of the fortress complex of Dagu, positioned at the mouth of the Hai river. Deputy Admiral Hildenbrandt of the Russian naval fleet, through Lieutenant Bakhmetev, sent a message to the fortress commander who called for the transfer of Dagu’s temporary control to the Alliance and surrendered by 2 am on the 17th of the Alliance. The American representative , Louis Kempff stated that he did not have the power to start hostilities. In any case, he granted the use of the Monacacy gunboat to house fleeing civilians. In reality, the fleet available to the alliance was small and could only count on a dozen boats, including the Monacacy destined for refugees. The men were around 900 against the over 2,000 Chinese soldiers. The Chinese forces continued to undermine the river and install explosives in the fort. On the evening of the 16th, foreign ships penetrated the river and took their positions while awaiting the attack. The Chinese did not await the expiration of the ultimatum to open fire: at 00:45 all the cannons fired at the alliance fleet. The most serious threat to the Allied fleet consisted of the four German-made torpedo boats available to the Chinese, who could easily have won, but inexplicably were not used and remained anchored. The allied troops landed on two fronts; taking advantage of the explosion of the Chinese armory, foreign forces succeeded in seizing the northern fort. Other two forts remained along the southern bank of the river. The whole artillery fired at the other two forts and soon the Chinese troops withdrew. The battles and the sudden attack against the allied ships had a profound impact. The first reports came to the court through the words of Governor Lu Yu in Tianjin, which emphasized the positive aspects, neglecting to mention the surrender of the fortifications to the Empress. The battle definitely pushed the Qing on the side of the boxers and the Chinese army was given the order to repel the invaders. On June 18th, Admiral Seymour with his 2000 men was attacked by the Chinese army near the railway that connected Tianjin to the capital. Seymour retired to Tianjin, renouncing his goal of reaching Beijing. On June 19, an ultimatum of surrender was handed over to the barricaded delegations in the city, ordering the withdrawal within 24 hours. On 20 June, when the delegations refused, the final siege began. A similar siege took place in Beitang, about four kilometers from the district of delegations, where a handful of priests and nuns, a few French and Italian soldiers and about 3000 Chinese Christians fought boxers. For many days after June 20, neither the assailants nor the assailants had a plan of attack or defense, and confusion reigned supreme. The Chinese troops were led by Ronglu, who had always been opposed to the boxers and the siege, while the besieged obeyed the orders of the British minister Claude MacDonald with the American diplomat Herbert G. Squiers who acted as chief of his staff. In any case, the various groups of foreign defenders worked more or less independently with MacDonald, who acted rather as a coordinator rather than commander-in-chief. 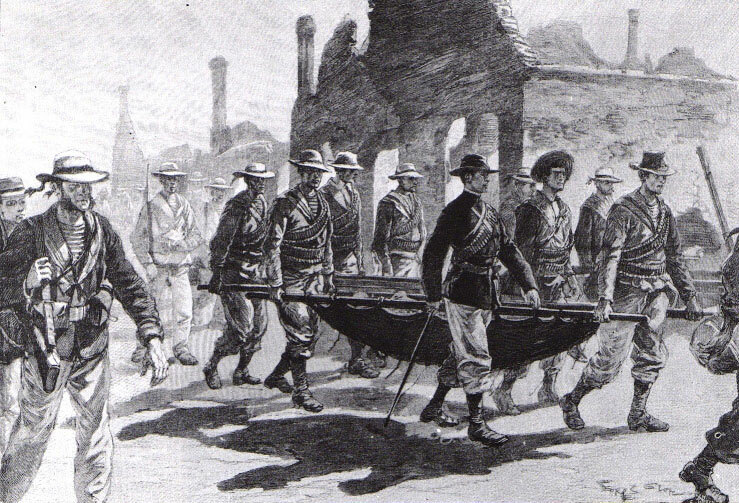 Admiral Symour takes refuge in Tianjin with wounded soldiers. For all 55 days, Ronglu’s various attempts to cease fire remained unheard due to the substantial distrust of both sides. In any case, the Chinese tried to flush out strangers with flames. In the first days of the siege, the soldiers set a fire in the buildings bordering the district of delegations. On June 23rd most of the buildings of the Hanlin Academy, the Chinese national library with its extremely rare texts, were lost. Both sides were accused of losing. 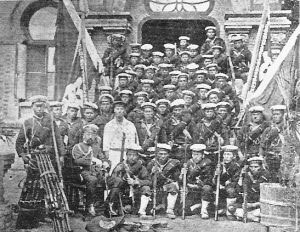 In a second phase, the Chinese focused their attention on the refuge of Chinese Christians and the area protected by the Japanese lieutenant Goro Shiba, probably the most admired military among all foreigners. Shiba at the head of a handful of Japanese soldiers managed to repel Chinese waves, thanks to the intervention of the British military. The most violent attack was that which took place between the 78 French and Austrian soldiers and 17 volunteers who had to resist the assault of the Chinese just 15 meters away. The Germans and the Americans occupied the main defensive positions along the Tartar Wall. In any case, the Chinese forces remained substantially divided even during the attack, with the anti-boxing faction of Ronglu and the anti-foreign faction led by Prince Duan. The position of the empress wavered between the two extremes. On 25 June Cixi proclaimed a respite for a few hours. In early July, however, foreigners had to resist the most dangerous threat since the beginning of the battle, when the Chinese troops managed to repel the Germans from defending the Tartar wall, leaving the American Marines alone in the defense. At the same time, a barricade was advanced to crush the Americans on two fronts, forcing Americans to choose whether to leave positions or launch a frontal assault. At two o’clock in the morning of 3 July, the small foreign forces (26 British, 15 Russians and 15 Americans led by Captain John T. Myers) threw a surprise attack on the Chinese, who were surprised in their sleep. Twenty Chinese fell, while the rest was forced to retreat and surrender control of the walls. But the worst was yet to happen. According to MacDonald’s words, July 13th was the darkest day. The Japanese and the Italians were driven from the Fu, the refuge of Chinese Christians, thus breaking the defensive lines. While the bulk of the Chinese forces burst into the Fu, a mine was detonated near the French delegation, forcing the French and the Austrians to surrender control of their area. The end now seemed close. The next day, however, a conciliatory message was sent by the Chinese. On July 17, Empress Cixi declared a cease-fire. By now the delegations were close to collapse; one-third of the soldiers had perished during the fighting or wounded. As a sign of good will, she sent food and supplies to the besieged. The move of the empress caused some clashes between Chinese boxers and military but most likely was dictated by the landing of a force of about 20,000 foreigners in China who was reaching Beijing by forced stops. On July 28, the barricaded foreigners received the first message from the outside after more than a month. A Chinese boy, a student of the missionary William Scott Ament, managed to sneak into the delegation’s quarters and deliver the message that the Eight Nations army had reached Tianjin and would soon be in Beijing. The one on August 13, with the Allied army at the gates of Beijing, was another night of hard fights. 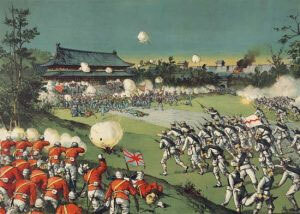 The Chinese broke the truce by striking the British delegation with artillery and burning the Fu. But they did not launch a direct assault until August 14, when the besieged heard the distant sound of a machine gun, a sign that the reinforcements had now arrived. Five contingents each of different nationalities (French, British, Russian, Japanese and American) aimed against five doors of the city. The small French group was defeated. The Americans climbed the walls and entered. However, the British were the first to arrive at the besieged district, managing to penetrate the city without practically finding opposition. The Sikhs and the Indian Rajputs had the honor of being the first to enter the district of delegations. The Chinese troops were fleeing. Shortly thereafter, the English general Alfred Gaselee was received by Sir Claude MacDonald in an impeccable tennis suit together with the ladies dressed for the party. After the battle, the troops of the defeated Chinese Muslims withdrew with the empress in Xi’an. The Empress and her court once abandoned in Beijing on August 15, retired to Shanxi for two years. Later the foreign armies allowed her return to the throne. The boxer war was a disaster for China but managed to dispel the destiny that now seemed inevitable, the foreign colonization of the country and to keep the nation united. The boxer movement disintegrated during the final siege. Some men were enlisted in the regular army, others returned to their homes in the countryside, also becoming an easy target for reprisals by foreign forces. 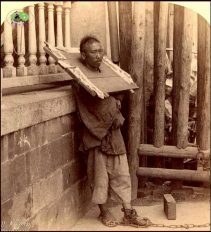 The foreign occupation of northern China threw the country into chaos and was marked by the infamy of the allied troops who carried out all kinds of violence and looting. In particular, the Japanese let themselves go to some of the darkest and most dramatic brackets of their history, imprinting in the soul of Chinese people a resentment that is still reflected in the foreign policies of both countries.